The Hornets recover from a tough loss to beat Sacramento. 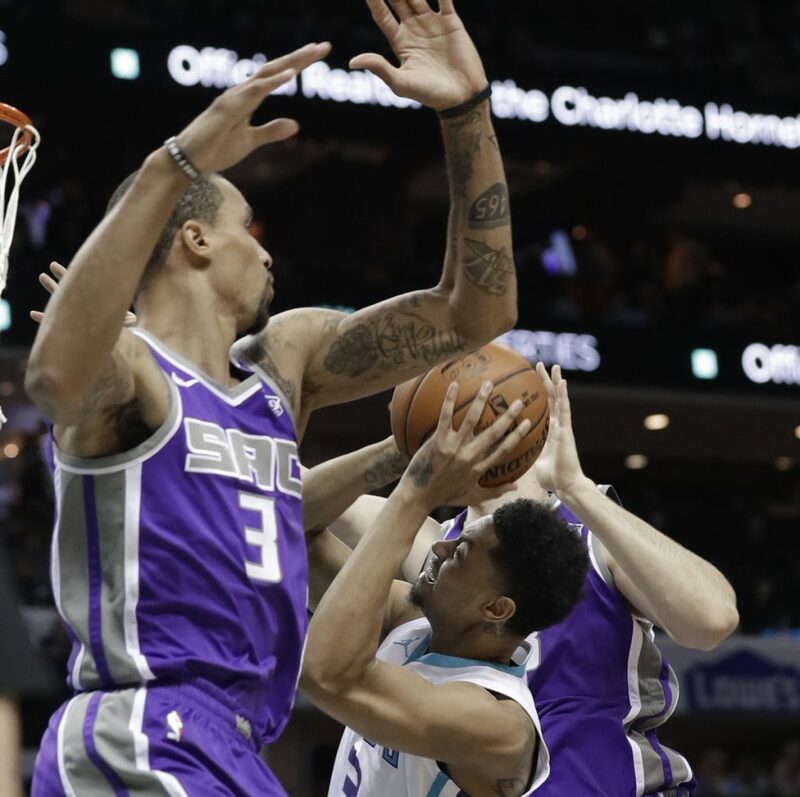 CHARLOTTE, N.C. — Kemba Walker had 26 points, Jeremy Lamb added 18 and the Charlotte Hornets bounced back from a tough loss to beat the Sacramento Kings 112-107 on Monday night. Nic Batum and Marvin Williams each had 14 points and Dwight Howard added 14 points and 16 rebounds for the Hornets, who have won six of their last nine. The Hornets were coming off an emotionally crushing 106-105 loss to the Miami Heat on Saturday night in which they surrendered a five-point lead in the final 34 seconds and lost on a last-second free throw. However, they came out with a purpose against the Kings, closing the first half with an 11-2 run to build a 12-point lead at the break. They extended the lead to 20 in the second half before allowing the lead to dwindle to three with 1:25 remaining after a 3-pointer by Bogdan Bogdanovic. But there would be no collapse on this night. ROCKETS 99, HEAT 90: James Harden had 28 points and Houston overcame a big early deficit to win at home. Miami led by double digits before halftime, but the game stayed close throughout most of the second half. It was tied with about three minutes left when Harden hit a 3-pointer just before the shot clock expired. That was the start of a 7-2 run that made it 95-90 with 38 seconds left. James Johnson missed a 3-pointer on the other end, but Miami’s Hassan Whiteside grabbed the rebound. Harden blocked his layup, and Houston added a dunk by Clint Capela with 18 seconds left. HAWKS 104, JAZZ 90: Dennis Schroder scored 20 points, Taurean Prince added 17 and host Atlanta kept up its improving play with a win over Utah. The Hawks began to pull away late in the third quarter, closing with a 13-3 run for a 74-63 lead that was their largest to that point. Dewayne Dedmon knocked down a 3-pointer, Malcolm Delaney converted a four-point play and Schroder scored off a couple of drives. BUCKS: Milwaukee fired Coach Jason Kidd amid a midseason slide that has left the playoff hopeful Bucks in eighth place in the East. It was a surprising end to Kidd’s three-plus season tenure in Milwaukee, when the Bucks made the playoffs twice. Giannis Antetokounmpo turned into an All-Star under his watch, and the Bucks were considered an emerging force in the East at the start of the season. Assistant coach Joe Prunty was serving as head coach. Under Kidd, the Bucks had a regular-season record of 139-152. Commentary: Is Tiger’s dominance truly appreciated by the next generation?